Campeggio Le Champ Neuf si trova a Saint-Quentin-en-Tourmont, Somme. Questo campeggio dispone di piazzole delimitate e piazzole poco ombreggiate. È possibile affittare casemobili, appartamenti e bungalow. Il campeggio dispone di un campo sportivo. Per gli sportivi, il campeggio prevede diversi percorsi in bicicletta. Ci sono un programma di animazione e uno spazio fitness. Per chi desidera rilassarsi dopo una giornata intensa ci sono sauna e idromassaggio. Il campeggio dispone di un parco acquatico, una piscina coperta riscaldata e una vasca per i più piccoli. Ogni anno un ispettore visita il Campeggio Le Champ Neuf, controllando oltre 200 tra attrezzature e altri punti di interesse del campeggio. L'ispettore è un dipendente ACSI e non lavora per il campeggio. Good mix of touring and residential pitches. Some pitches small but surrounded by hedges for privacy. peaceful and well positioned for walking and cycling direct from site. Ideally placed for visiting the Parc du Marquenterre, within walking distance. Great pitch with privacy hedges. We arrived only 2 days after they opened so the staff were busy getting the site ready after the winter. As with many sites we have visited only a couple of showers and toilets open but clean and hot showers. New wash up area, 800m from the national park and lots of cycle routes to crotoy. Would visit again. Thoroughly enjoyed our 37 night stay at this site. This is the second time we have visited and it will not be the last. The family who run this site put an amazing amount of care into every aspect of the site. They are constantly updating the facilities and improving the site. The pool complex is fabulous,always spotless and warm.There are many different types of pitch available. The facilities are cleaned regularly throughout the day and are warm and inviting. We have yet to find a better site. Had to unhitch & use motor mover to get onto allocated very small pitch amongst chalets. Toilets lacked seats and often paper. Washbasin water was cold. We were told that toilet facilities near reception were better. Reception did not open till 9am. Only food available were Fritterie on Saturday evening and Pizza Takeaway on Sunday evening. No bar. We received a very warm welcome when we returned for a second year. The facilities were as good as we remembered, and we were able to use the free wifi from our pitch. This year we found the bird park quite nearby, and within walking distance, where the restaurant was very nice to use for meals or just coffee. Horse drawn buggy rides are available round the nature reserve from the visitor centre. We wish we had found this last year! Lovely holiday, just a bit disappointed with the pitch we were allocated as very narrow at front so had to unhitch caravan to get on it. We don't have a motor mover but fortunately got help to push caravan onto pitch from other campers, we also helped a couple opposite who had the same problem when they arrived. Thought our pitch and others more suited to motorhomes rather than caravans. Would definitely book again but request a pitch on their open pitch area, no screening but plenty of room/space to pitch a caravan and seemed to be quieter than where we were. Very good campsite, well maintained, clean facilities and hot water for showers and washing up. Enjoyed our stay. Fantastic site, wonderful friendly staff. Made very welcome by the local people who stay on the site regular. Excellent site for us to tour the area. Was excellent for a late holiday into France not too far from Calais. Will go again. This is without doubt the best campsite in the Somme area. I know because I have visited them all. The swimming pool is fantastic and is properly heated. The pitches are all of a generous size and are very well kept, separated by nice bushes and flowers. The sanitary facilites are good and very clean, with hot water all day. The staff are very friendly and helpful. Nothing is too much trouble for any of them. We came to stay for a couple of days and stayed for 9. We will stay for many more in the future. A good well run campsite with nice toilet facilities. The pitches are large and the whole place is well kept. Not much English spoken at reception but this was not a problem. Volete prenotare il campeggio Campeggio Le Champ Neuf o oppure saperne di più? Potete farlo usando i seguenti dati oppure tramite il sito del campeggio. Il camping è a Le Bout des Crocs e si raggiunge con la D204, seguendo i cartelli 'Parc Ornithologique'. Seguire i cartelli del campeggio e non il navigatore nell'ultimo tratto. 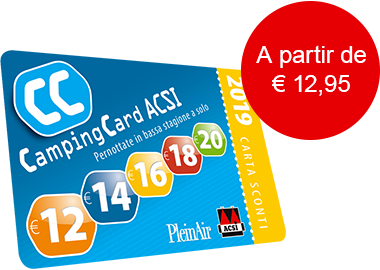 ACSI Eurocampings invia la tua richiesta di informazioni al "Campeggio Le Champ Neuf".